Amal Clooney’s career as an international human rights attorney places her in the same circles as the most successful people in the world, and she’s asked them to share their secrets. 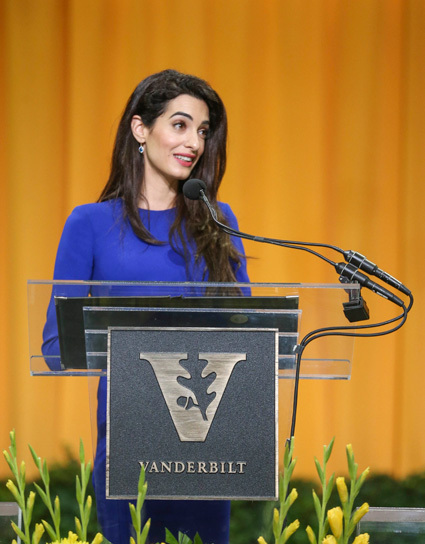 In a Senior Day speech Thursday that brought a packed Memorial Gymnasium to its feet, Clooney took the crowd through historic examples of courage, including Vanderbilt Distinguished Alumnus and civil rights-era icon Rev. James Lawson. She shared the stories of her own clients today, who include a journalist jailed for reporting corruption by Azerbaijan’s president and an advocate for sexual violence survivors who herself was enslaved by the Islamic State. Chancellor Nicholas S. Zeppos awarded Clooney the 2018 Nichols-Chancellor’s Medal, created and endowed by Vanderbilt Law School graduate Ed Nichols and his wife, Janice, and given to those who exemplify the best qualities of the human spirit. A welcome began with Interfaith Council President Shawn Kerry and featured Olivia Solow-Niederman, Hersheyth Aggarwal, Hamza Patel and Alexis Cook, representing Judaism, Hinduism, Islam and Christianity. 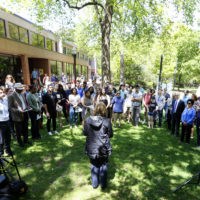 Zeppos thanked Claire Fogarty, overall chair of the Senior Class Fund, lauding her accomplishment of leading a record-breaking 85 percent participation rate in the fund, and Perry Brandt, president of the Vanderbilt Alumni Association. 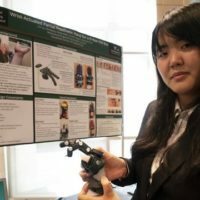 Clooney continued the feeling of celebration, encouraging graduates to take a moment to enjoy their accomplishments and then demonstrate what they care about through their careers and the choices they make each day.